Scott Stitcher, a director at PFM Asset Management, which invests the city’s $44 million portfolio, summarized the city’s investments for the Palm Coast City Council this morning, as the company does once a year. He reassured the council that the city should still be earning money in 2019, even though a key indicator is pointing toward a recession–but not just yet–and income in 2019 may not be as robust as it has been previously. The city’s investment report may be dull to most. In fact, it reflects what many residents on fixed income and in any way reliant on market vagaries may experience on their own account. So the city’s health can be seen as somewhat of a mirror of its residents’ financial health. Twenty-seven percent of the city’s population is 65 or older, compared to 20 percent in Florida and nearing 17 percent in the United States. The presentation was part of this morning’s council workshop, the first attended by Matt Morton, the new city manager, who started work Monday. Over the past year, the city’s portfolio earned over 3 percent–the first time in more than a decade that that type of portfolio could earn that high a return. He said one indicator is “a yellow warning signal” about a possible recession: the inversion of the Treasury yield curve, which means that long-term rates are below short-term rates. That happened on March 22, when the 10-year Treasury note fell to 2.42 percent, lower than the rate on three-month bills for the first time in 12 years. The last six times that happened, going back to the 1960s, a recession has followed. But about 15 months elapsed on average between the inversion and the last five recessions. To reassure the council, Stitcher said the economy is nowhere near where it was in 2008. Yet “the fourth quarter was not for the faint of heart,” he said, with the inversion, trade tension, a government shutdown and a 14 percent selloff in the market–activity that flows into fixed-income markets and affects Palm Coast’s large pool of retired residents. As for the city, “we think you will receive I’ll say positive returns in 2019, respectable returns in 2019, and the majority of that will come from the income portion of your portfolio,” Stitcher said, even though interest rates could fall in 2019. State law requires government’s investments to have a large proportion of funds in safe investments. Half of Palm Coast’s investments are in Treasuries, asset-backed securities and federal agency securities, or so-called government-sponsored enterprises. But the city also owns small portions of corporate stocks–among them Apple, IBM, John Deere, Toyota, American Express, Disney, Exxon, Pfizer, Coca Cola, Home Depot, Walmart, Hyundai, and UPS, among others. The city also invests in five international banks devoted to development in poorer countries. Mayor Milissa Holland asked Stitcher whether he saw policies “as us amending to provide more of a return on investment.” But in 2015 and 2016, the city added the sort of investment sectors that worked to that end. “Right now there’s nothing we would recommend as far as an enhancement to the policy,” he said. 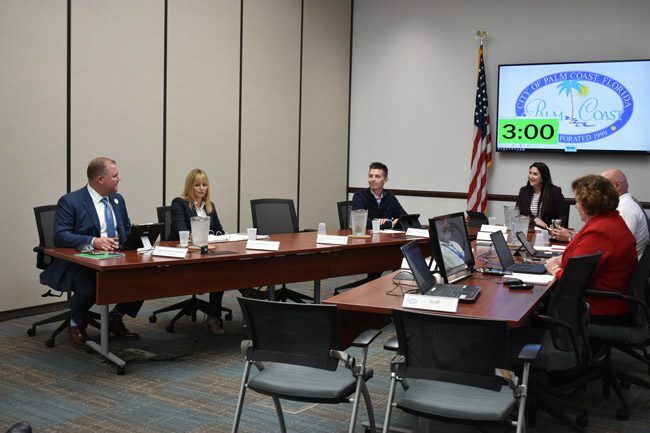 Morton’s first meeting was uneventful, his first few official items of discussion even less so: he introduced a $194,000 plan to replace the city’s phone system with a cloud-based voice over IP phone system, the result of a bid process that produced 14 bidders. Verteks Consulting of Ocala won the bid. Annual servicing will cost $40,000, about $3,000 less than current costs. The project is part of the city’s information technology priorities. Morton also briefed the council on the annual agreement with the East Flagler Mosquito Control District for coming chemical bombardments, and sod replacement at Indian Trails Sports Complex. Notably, Morton, who tends to speak at Mach speed, presented the item as if he were as conversant with them as any of the city staffers in the room. Morton was otherwise more of an observer than a participant at Tuesday’s meeting–at least until the meeting’s last third–as he sat at the end of the V-shaped table arrangement reconfigured at Holland’s request several months ago, with Holland sitting at the head of the inverted V. When he was the manager until last fall, the notoriously controlling Jim Landon had positioned himself in such a way that he appeared to be at the command center of the table arrangements, with the council members fanning out in two side wings. Discussions got more animated in that final third of the meeting when the council, at Councilman Nick Klufas’s prompting, returned to the discussion about the city’s FiberNet, or broadband, system, the city’s data management and what direction it should take. Morton, who is married and has two children, will be renting for about a year before the family decides on a local property. Earning a whopping 2% return in a bear market! OK Roy: Better than it was?? What’s the problem ???????????? Meant to write “bull” market. The problem is, neisontorrisi, that with a $44 milllion portfolio and paying fees to a financial management firm who gets you 1 to 2 % is seriously inept. With inflation they are losing money. Something sounds off with the return on investment. I would have this reviewed. Super-ultra conservative investing. Doesn’t fit so well with the liberal spending. I attended this Tuesday 9 at 9AM council meeting. I left somewhat disappointed when at meetings end councilman. Flukas was insisting to get approval to instruct manager Morton to hire two IT engineers and to transfer our Utility Data center to city hall starting with a cost that is NOT included in our current budget but instead drawing to start about half a million dollars from our capital projects funds not intended for this purpose. We have currently the data center located and doing well in Utility Drive so “if ain’t broke why move it” the final cost of this move will be astronomical to Palmcoasters hard earned taxes. Branquinho and Cuff realistically opposed Flukas proposal to add to high paid positions with NO current budget assigned increasing the current staff payroll. Then of course the “new manager as I envisioned” when asked by the mayor sided with Flukas and her. I had to walk out at that moment was too much for this taxpayer seeing this IT Innovation and Broadband/Fiber optic swallowing our hard earned millions when blight, drainage. sewer, lightning, widening of Old Kings Road and Florida Park Drive traffic and blight still is the back burner. Flukas keeps on digging into our capital and general funds to pay up for his IT pet project, making a would be millionaire cost and unexpected disconnect of an unneeded move of the utility current data center location which is working fine. Mayor paying fortunes to invent and IT Residents Portal while the few or no so few that attend the council meetings with issues at times in their 3 minutes request are not addressed or get her gable, if do not keep silent. If our current calling system to pay bills or request solutions to a problem is working fine why to spend in fixing what ain’t broke? Councilman Howell was absent taking his Harvard leadership course but I sure know he will be supporting Cuff and Branquinho common sense opposition in spite of Mr. Morton’s sided view. Why have the Mayor and Klufas forgotten the dangerous working conditions at the Public Works Building. No more spending on non-essentials until the dangerous working conditions are fixed.You know Council Howell will vote this down so my hope is Councilman Cuff dose not change. The new City Manager needs to know he maybe hitching up to the wrong horse as Klufas and the Mayor should be gone if the voters of Palm Coast have any sense. Klufas is a senior development engineer at ACI in Palm Coast.